Paul Henderson: That's what's wrong with the present day horrorfilms. There's no realism. Not like the old ones, the great ones. Frankenstein. Phantom of the Opera. Dracula - the one with Bela Lugosi of course, not this new fellow. 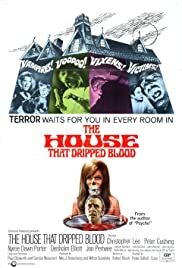 "The House That Dripped Blood" is an anthology from horror studio Amicus with the lead story and four segments, all of them engaging and entertaining. Fans of horror films from Amicus and Hammer will certainly not be disappointed with the segments and the conclusion. My vote is eight.